One of America's greatest rivers has played host to ROW Adventures' guest for decades. 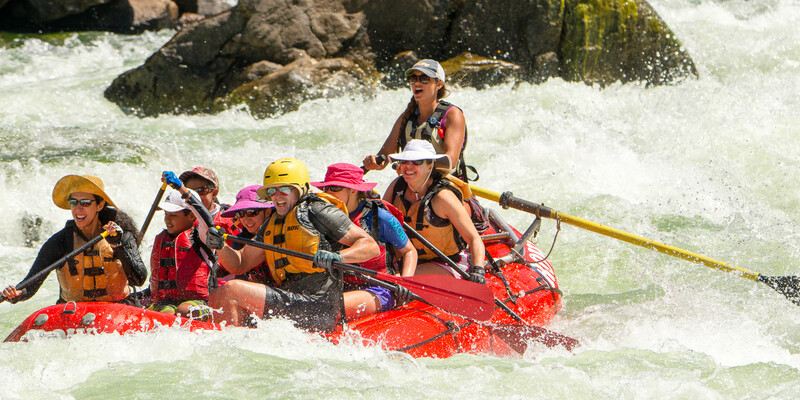 If you have not experience rafting the Snake River, it's white water rapids, incredible hikes and history, the country's deepest river canyon with the world's greatest guides...you should not wait any longer! Hells Canyon straddles the borders of Idaho and Oregon and is the deepest river gorge in North America. According to Nez Perce tribal legend, the mythical figure "coyote" dug Hells Canyon with a big stick to protect the tribe's ancestors in the Blue Mountains of Oregon from the "Seven Devils" across the gorge in Idaho. Our Snake River rafting adventures through Hells Canyon are journeys through a land rich in myth and geologic wonder. Running south to north, the Snake River cuts through some of the most rugged, spectacular landscape on earth. Boulders and rock slides have rolled into the river to create the biggest white water rafting rapids in the Pacific Northwest. High-crested waves and paddle-swallowing holes drench us in white water excitement. When you go to Hells Canyon with ROW Adventures, we send a cargo boat ahead to set up a comfortable wilderness camp. Instead of spending time setting up your own tent, you can be hiking, fishing or otherwise relaxing. Our meals are superlative, made with the finest fresh ingredients and prepared by our talented staff. Between the Snake River whitewater, there's plenty of time to kick back and marvel at the snow-capped peaks that tower more than a mile above. Mountainsides are covered in golden grass and pine forest and we commonly see soaring eagles, ambling bears or wild mountain goats. Extend your stay in Idaho after your Snake River trip by visiting our own River Dance Lodge just two hours from Lewiston, Idaho where your trip ends. Stay in a traditional log cabin with private hot tub, go hiking, fly fishing, horseback riding, mountain biking or just relax and enjoy the Rocky Mountain scenery. Travel from your home to Cambridge, Idaho and meet ROW’s Team Leader at the Frontier Motel at 8:00 PM Mountain Standard Time (MST) for a one-hour orientation meeting to answer last-minute questions. You'll also receive your waterproof gear bags. Dinner on your own. Meet your team leader at 7:30am for the two-hour bus ride to Hells Canyon rafting trip on the Snake River. We'll stop along the way for a ROW-hosted breakfast. Our launch point is at the base of Hells Canyon Dam, approximately 1,500 feet above sea level. Before launching rafts the ROW staff prepares you with a thorough safety briefing while personal gear is loaded. The briefing covers how to ride in a raft, how to paddle, how to swim through rapids and other tips for the days ahead. Once this is complete everyone chooses a raft and climbs aboard. The Snake River has “pool and drop” characteristics. This means there's a long pool of calm water followed by a rapid. Not long after launching we run several splashy Hells Canyon rapids that give a fun, roller coaster ride a taste of what's to come. When we stop for lunch, some guides prepare the meal while others give a “camp orientation” to explain how we minimize our impact on the river. ROW adheres to "Leave No Trace" camping ethics, so you'll learn where to wash up, how the toilet system works, where to brush your teeth, place trash, etc. Then it’s time to make a sandwich and enjoy the open-air dining experience. We usually run two big class IV rapids the first day – Wild Sheep and Granite. These impressive rapids never fail to get a guide’s heart pumping. This is also a great day for fishing. The water is a bit cooler at this elevation and fishing for trout in the tail waters of the rapids is almost always successful. Around 4:00pm we arrive at camp with plenty of free time for hiking, fishing, reading or just relaxing. Hors d’oeuvres are served around 6:00 and dinner around 7:30. The evening sky darkens and the first shimmering stars appear, inviting contemplation on the day and conversation with friends, new and old. You'll wake around 7:00am to the smell of fresh-brewed coffee and tea. Breakfast is served around 7:30 and while we clean up the kitchen, you pack up your personal gear. We depart camp about 9:30 for today's Hells Canyon rafting adventure. Plenty of rapids, sun and dramatic scenery treat you and we'll explore a homesteader's cabin, root cellar and farm implements. You'll get a good sense of what pioneer life would have been like 100 years ago. After more Snake River whitewater rafting, the river mellows and we have time to jump in and float along with our rafts. The mountains tower above and you relax in the warm sun. There are over 100 Native American rock art sites along the Snake River in Hells Canyon and during the trip we'll stop to investigate a few. Hells Canyon is unique because we find both pictographs (rock paintings) and petroglyphs (rock carvings) left by the different tribes that traveled the canyon. Camp tonight is somewhere in the Salt Creek area. After dinner another peaceful evening awaits. The night sky creates a perfect time for connecting with family and friends. Bonds grow stronger and memories build. Today we'll hike along the trail at “Suicide Point.” This incredible view offers sweeping panoramas some 300’ above your Snake River rafting trip. After the hike we float to our next stop at Kirkwood Historic Ranch, a historic sheep ranch. We visit the sheering shed, blacksmith shop and homesteader cabins. Before the creation of the Hells Canyon National Recreation Area thousands of sheep grazed in the surrounding mountains. Soon the canyon opens up and we crash through some big wave rapids. When we arrive at Pittsburg Landing, where our 3-day trips end, we take a short hike to see one of the richest collections of Indian petroglyphs on the Snake. After Pittsburg Landing the river narrows and the area's beauty intensifies. At camp this evening our guides may set up horseshoes or guide a hike. We'll refuel with a nutritious meal and the night sky and fresh mountain air will help you sleep like a baby. Today’s spectacular scenery and Hells Canyon whitewater is complemented by short history lessons. We'll see the ford used by Chief Joseph and the Wallowa band of the Nez Perce Indians during the famous 1877 exodus from their homeland. At China Creek we learn about the massacre of Chinese miners who were thought to have had a large cache of gold. The human drama in Hells Canyon rafting trips is as intriguing as the many natural wonders we discover, like the fascinating wildlife, plant life and geology. It’s been another full day of river rafting fun and discovery. Tonight we camp on a large, white sand beach. We'll have time for playing on the beach, sunbathing and another evening of laughter and camaraderie under Idaho's star-studded sky. The Salmon, where we run our Salmon River rafting trips, ends its journey and mingles with the waters of the mighty Snake in a powerful joining of forces. We now float on double the volume of water as compared to just the Snake River alone. We stop for another fine lunch on a sandy beach then dawn big smiles for a group photo. After a few more miles of magnificent scenery we reach our take-out spot below the Snake River's confluence with the Grande Ronde River. Gear is untied and everyone carries their personal gear to the waiting bus. It’s a quick 45-minute ride back to the town of Lewiston, Idaho. Enjoy a hot shower, change clothes and then meet your guides around 7:00pm for a ROW-hosted dinner at a local restaurant. Depart the next morning to head home, or consider visiting our own River Dance Lodge, a beautiful log cabin adventure resort just two hours east. Horseback riding, hiking, fishing and biking are a few of the available activities. If you're on your way to Glacier National Park this is a great stopping point for a day. Next Morning Departure: If you drove to Cambridge and had your car shuttled north it will be waiting for you at the hotel. If you're flying there’s a free shuttle from the hotel to the Lewiston airport. Or you can take a taxi two hours north to the Spokane airport. ROW Adventures is proud to be an Equal Opportunity recreation service provider under permit from the U.S. Forest Service, Hells Canyon National Recreation Area and licensed by the States of Idaho and Oregon. All our operations and facilities are operated on a non-discriminatory basis. We also operate under licenses from the states of Idaho and Oregon. Why choose ROW for your Snake river adventure? ROW Adventures is a seven-time National Geographic award-winning company. We haven't only been "operating" since 1979, we've never changed ownership! And since 1986, we've been providing amazing adventures on the Snake River. Our itinerary is designed to visit many different points of interest, taking advantage of rock art sites, pioneer homesteads, and natural wonders in the river canyon. You may only float through Hells Canyon once in your life and we want to make sure you see the best that it has to offer. We are one of very few outfitters who have a cargo boat travel ahead to set up camp, including your tent and a complete kitchen with tables and chairs. This means when you get to camp you're free to explore – hike, fish, relax under a tree, rather than worry about the cumbersome unloading of cargo each day and setting up tents each night. Our luxury-style camping includes all camping gear such as tents, sleeping bags and thick, self-inflating mattresses. All rafting gear is also included to make things easy for you. Your trip is enriched by knowledgeable guides who share the canyon's cultural and natural history. No other company on the Snake River trains guides like we do, and most of our guides are also Certified Interpretive Guides through the National Association for Interpretation. We staff our trips with one guide for every 3-4 guests providing you the ultimate in personal attention. Complimentary beer, wine, juice and soda, all in moderate quantities, is provided. We are proud to serve fine local Northwest wines. We always have plenty of ice! We offer you a choice of river craft including oar rafts, paddle rafts, and inflatable kayaks. Trip logistics are designed to maximize time on the river - floating from Hells Canyon Dam to either Pittsburg Landing or Heller Bar depending on the length of trip. We provide complimentary wetsuits & wetsuit booties early and late season to make sure you stay warm and comfortable on the river. At the end of the trip we close the circle of friendship and celebration with a festive, hosted farewell dinner. Shuttle from the Boise, Idaho Airport to the meeting point of the trip is included. Pre- and Post-trip hotel reservations are handled by our competent office staff (hotel costs are not included in your basic trip cost). Trips can be chartered for special occasions - bachelor / bachelorette parties, family reunions, all women/men groups, etc. You can combine your Snake River trip with a 2- or 3-day Lochsa River trip - creating an adrenaline filled adventure! Or stay at our River Dance Lodge before or after your Snake River rafting trips. These are both ROW exclusives. What are typical meals on the river? The quality of our food reflects the quality of the wilderness environment on the Snake River. We hand-select the freshest fruits and vegetables we can find and pack them carefully in huge ice-coolers. Likewise, these coolers carry fresh dairy products and meats. From these ingredients, we prepare bountiful, healthy meals. These are a few possible entrees. Our desserts are made each evening in our Dutch ovens and range from authentic cobbler to pineapple upside-down cake. We serve juice each morning and moderate amounts of bottled wine with dinner. We also provide two beers and two sodas or juices per person per day. There's always plenty of cold water, lemonade mix, tea, coffee, and cocoa. You're welcome to bring your own beverages or alcohol as well. We always have plenty of ice to keep your drinks cold. What is riverside camping like? Forget those images of leaky tents and camp food out of a can. You’ll be amazed how comfortable camping can be when done the ROW way. On trips with 13 or more guests, we use a large 22-foot cargo raft to carry the bulk of the camping gear, food, etc. This allows our smaller oar-powered rafts to be lighter and more maneuverable. The elevation on the Snake River in Hells Canyon is only 1,500’ at the put-in and around 800’ at the take-out. This means the weather is typically much warmer than other parts of Idaho. This trip is excellent throughout the season, but the Snake River in Hells Canyon is an ideal choice for spring or fall vacations because of the mild climate and few other people. What are typical weather and water conditions? Hells Canyon Dam controls water flow so there are excellent levels year round but the highest water is typically in June and September. Air temperatures in the spring and fall range from 65-85 degrees and most nights cool to around 45-50 degrees Fahrenheit. It's warmer in late June through late August with daytime temperatures between 85-95 degrees, dropping to 65-70 degrees at night. It rarely rains in Hells Canyon, but sometimes we'll witness a dramatic thundershower which instantly freshens the air. Water temperatures are usually around 60 degrees in June and September, and 70 degrees in July and August. What type of watercraft do you use? In addition to the cargo boat that carries all the camping gear, we use two other kinds of river craft. We also offer smaller 14-foot paddle rafts. Four to six people paddle while a guide steers. On any river trips, the guides are the most important factor for your safety, enjoyment and the success of the trips. ROW guides are exceptional people with years of river experience. We maintain a tobacco-free policy and most of our guides have taken interpretation courses from certified instructors. We look for guides who are willing and eager to share, teach, listen, learn, laugh, play, discuss and, above all, work hard to provide a safe, relaxed and spontaneous adventure. What are the differences between various trip lengths? We believe the Snake River offers one of the world's premier rafting experiences and deserves a minimum of five days to appreciate its many wonders. Our Forest Service permit is very restrictive, allowing just one trip every eight days, so we like to maximize our guests' time on the river. What do we do when we are not on the river? One of the reasons that Hells Canyon is such a fabulous trip is the incredible variety of things to do and see along the way. ROW takes pride in historical interpretation and takes advantage of as many side excursions as possible. We share stories of the early pioneers and hike to at least one old homestead cabin. We explore at least two different Native American rock art sites. If the group wants more we know a couple dozen other points of interest along the way. Not only do we show you these places, we help you understand them. If you're interested we'll talk about the geology, plants, and animals that inhabit Hells Canyon. We strongly believe that deepening understanding builds greater appreciation and we hope our love of this canyon is contagious. How do I get to and from the Rivers edge? Fly into Boise, Idaho the evening prior to your departure date and take the ROW shuttle up to Cambridge. Then after the trip return home via Lewiston, Idaho or Spokane, Washington. Arrive in Boise no later than 4:00 pm Mountain Time the day before your trip. The shuttle van (provided by Harlow’s Transportation Service) will meet you outside the baggage claim doors in the “taxi” lane at 4:30 pm for an easy two-hour drive to Cambridge. A) Fly out of the Lewiston Airport (Airport shuttle provided free by the Red Lion Inn) to your hometown or back to Boise, Idaho to connect with your round-trip flight. Lewiston is serviced by Horizon Air or Delta Air only. B) Take a shuttle van/taxi to Spokane, Washington (two hours north) for a better selection of flights as Spokane has a much larger airport. If you choose to shuttle to Spokane. Drive to Cambridge, Idaho and arrange for the Frontier Motel to shuttle your vehicle north while you are on the river. Plan to arrive in Cambridge in time for the 8:00 pm Orientation meeting. On all 3-day trips and some 4-day trips your car will go to White Bird or our actual take-out at Pittsburg Landing. The cost to have the vehicle shuttled to Whitebird is $110 (not including fuel). If you have your car shuttled to the Pittsburg Landing the cost is $145. Rent a car and drive two hours to Cambridge. Then have it shuttled to the ending point of the trip, as per the above paragraph. Take an airport shuttle from Boise to Cambridge. Contact either Boise City Taxi at 208-377-3333 or use an Uber. If you are unable to schedule your flight into Boise by 4:00 pm or if your flight arrives late and you need to arrange other transportation, the cost for this transportation will be at your expense.